As well as Queueing up curated and Evergreen Content, you can manually set times and dates for your posts, allowing you to plan campaigns, celebrate holidays and post time-sensitive content at the time and date of your choosing. 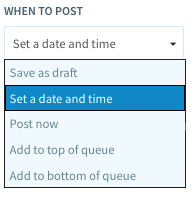 To schedule a Post, click the drop-down menu under “When to Post.” Choose Set a date and time. You’ll then be asked for the specific date/time you want the post to publish. 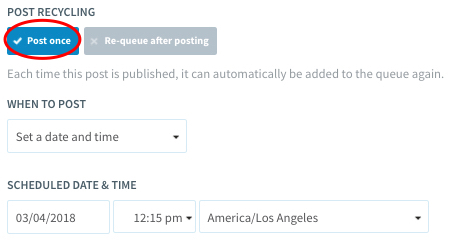 You can also set the post to just publish once by choosing One Time instead of Re-Queue After Posting. Note: If you choose “Re-Queue after posting,” the Post will publish at the time that you schedule and then be moved back to the bottom of the Queue in the next available Timeslot for that Category/account. This is a great way to set a start date for an Evergreen Post.